This year Scorch had to try out for Little League to see what division he’d play in. 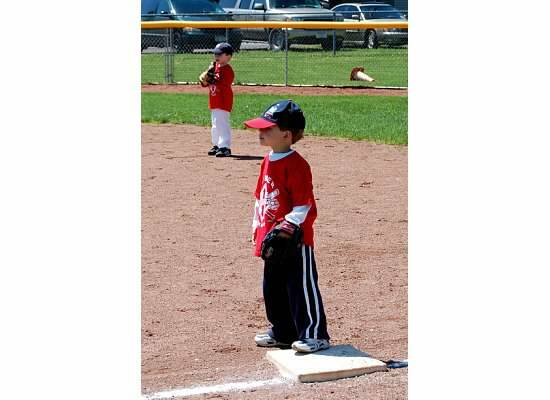 If he was deemed ready, he’d get pulled up to the Minors division (roughly ages 8 – 10/11); if not, he’d stay at the Rookies (ages 5 – 8). He didn’t much care either way so he went to tryouts, did his best and called it a day. We found out a few days later that he made it into the Minors so that is how Scorch became the smallest kid on his team. Scorch wasn’t the best kid on the team by a long shot. He doesn’t have the bigger kid’s strength, speed or game knowledge. But damned if he didn’t try. He worked hard (most of the time) and just enjoyed the hell out of playing ball. He, and the rest of his teammates, got better and better as the season went on and it was a blast watching them play. Back when he was 4 and every game ended in a tie. Tonight we found ourselves in the run for the Championship game. Playoffs are double elimination and we’d already lost a game. We started out losing badly, but managed to come back so we were down by 2 in our last at bats. Bases were loaded, 2 outs and Scorch was up. I couldn’t watch- my heart was in my throat. 2 balls and 2 strikes. And then Scorch strikes out. Just like that, the season is over. Scorch came out of the dugout after the game with his head held high. He thanked his coaches for a great season and said goodbye to his teammates. But on the way back to the car, his chin started to quiver and his eyes filled up. I pulled him aside to let the Bean go ahead and we had a long conversation about the season, how well he tried, how much he improved and how it was Ok to be sad that the season was over and it was even fine to be disappointed about how it ended but that it wasn’t Ok to beat himself up. He listened without saying a word and quietly climbed into the car. This is Scorch’s first experience with real heartbreak and disappointment. I know in my head that all kids go through this and have to deal with losing sooner or later. I also know it’s good for them- it builds character and makes the kids try even harder next time. But it doesn’t mean it’s easy to see. My mama bear instinct is to wrap my baby up in bubblewrap and let him go on thinking he’s the best around because that’s easier. It’s simpler and it’s safer. He’s 8 for goodness sake- isn’t that just one step removed from an infant?! But I don’t do that because that doesn’t help him in the long run. I hug him, I love him and I tell him how proud I am of him and that I’m here to talk if wants. And then I let him figure out how to sort through this hard knock himself because I know while it may be the first, it’s won’t be the last. Sometimes growing up is just plain hard.